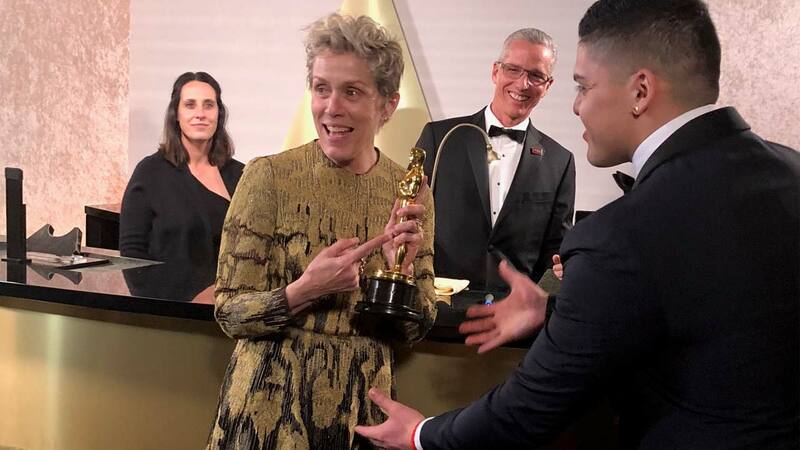 Frances McDormand gets her Oscar award engraved following the award show on Sunday, March 4, 2018. The "Three Billboards Outside Ebbing, Missouri" actress was spotted at the party getting her Oscar engraved. The 60-year-old star realized later that it had gone missing. The Los Angeles Police Department confirmed to ABC News that Terry Bryant, 47, was arrested late Sunday night for the alleged crime, and booked early Monday morning. He was charged with grand theft and police set a bail of $20,000. ABC News reached out to a rep for McDormand but didn't immediately hear back. Her rep, however, did tell USA Today in a statement: "Fran and Oscar are happily reunited and are enjoying an In-N-Out burger together." In a statement, the Academy of Motion Picture Arts and Sciences expressed relief that McDormand was reunited with her trophy. "Best Actress winner Frances McDormand and her Oscar were happily reunited after a brief separation at last night's Governors Ball," the statement read. "The alleged thief was quickly apprehended by a photographer and members of our fast-acting Academy and security teams. The 'Three Billboards Outside Ebbing, Missouri' star resumed her celebrations."